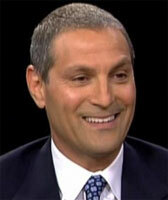 ARIEL "ARI" EMANUEL co-founded the Endeavor Talent Agency in 1995. He is the co-CEO of William Morris Endeavor Entertainment, the second-largest agency in Hollywood. He represents a long list of clients that includes people like Michael Moore, Mark Wahlberg, Larry David, Martin Scorsese, Aaron Sorkin and Conan O’Brien.